A while back I got an old, single-sided Caruso record. These are not rare and not extremely valuable, but they are old. In this online and connected world a lot can be found out about such a simple old disk, adding a bit of history and context. The label already gives much information. Of course the artist, world famous tenor Enrique Caruso, the music (E Lucevan Le Stelle from Tosca) and the composer (Puccini), but also the manufacturer and catalogue number 7-52002. Being single-sided of course already dates it to the early 20th century, though companies persisted in making single-sided records even into the twenties. 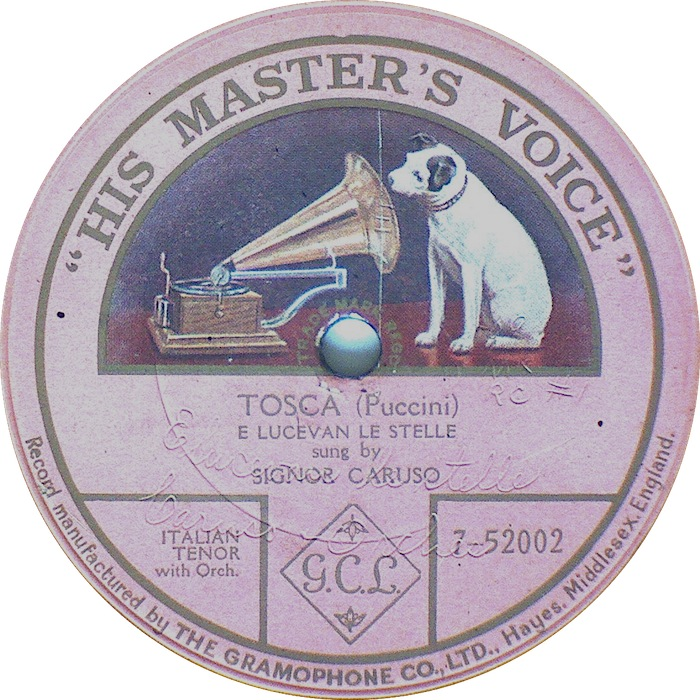 The Gramophone Company (briefly The Gramophone & Typewriter Ltd.) started using "His Master's Voice" as a label with the Barraud painting of the dog listening to a gramophone from 1909 onwards. Famous artists for a brief period got their own label colour; for Caruso a lavender label. After around 1920 this was done no longer and the colour would indicate the series (e.g. classical or popular) or price-range. Even more precise dating of the record is possible, because much of the original ledgers of The Victor Company have been digitized and made available online! 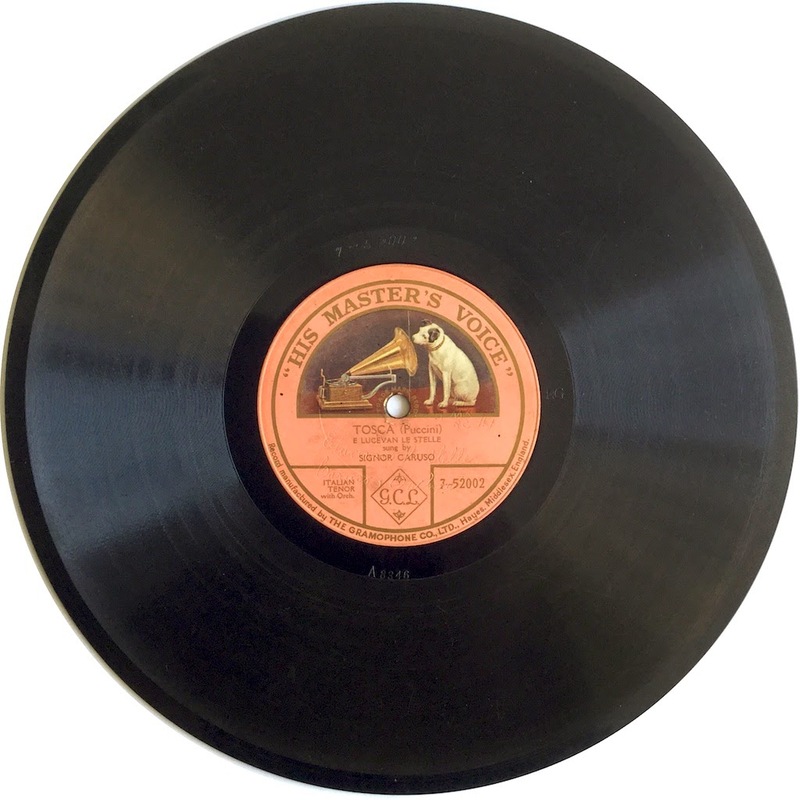 This HMV record was made from a Victor recording, like many HMV records. This particular performance was recorded in Camden, NJ on 11/6/1909, the matrix number 8346 is scratched into the runout of the matrix. Notable is that the Victor books state B-8346 as matrix number and this matrix had A-8346 written on it. This same A/B numbering happens also on other records, it may be that routinely two matrices were made and the 'A' shipped off to England and the 'B' kept in Camden. The numbers as well as artist and title can be seen (with difficulty) handwritten on the label area in relief on the matrix. Also part of the date can still be read (..6-09) and 'RC #1' ('recording #1'?). With this information, probably this record will have been made around 1910. The blank side has the writing angel and 'GRAMOPHONE' marking, but no 'Made in Hannover' so likely pressed in the Hayes, England factory. 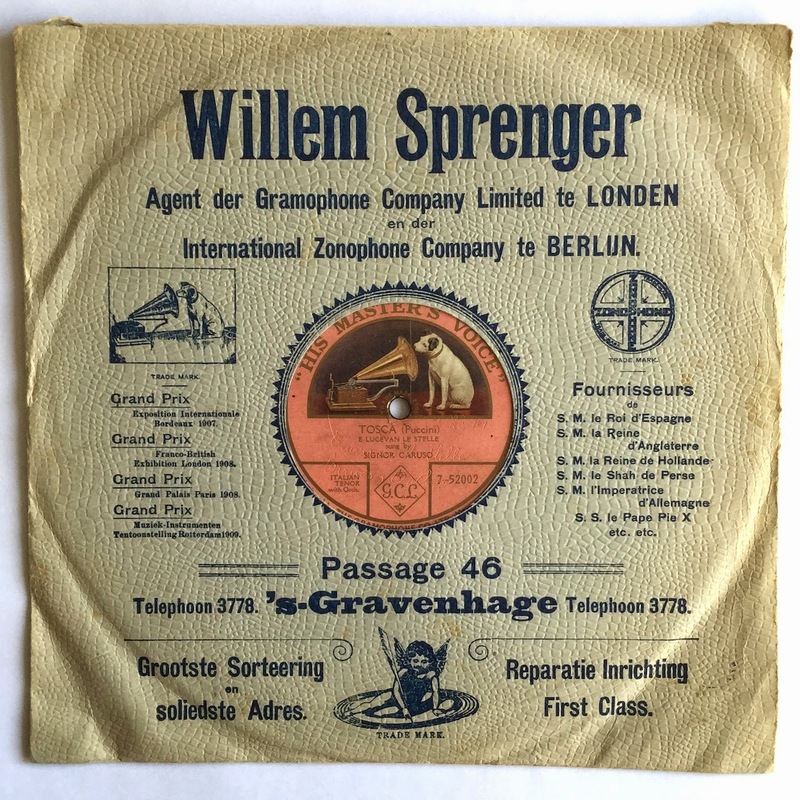 The record is now stored in a sleeve from the music shop of Willem Sprenger in The Hague ('s Gravenhage). It advertises that the shop is agent for The Gramophone Company and for The Zonophone Company. After about 1903, Victor and The Gramophone Company (makers of gram-o-phones) had acquired control over the various Zonophone companies (makers of zon-o-phones). This was after some lawsuits and shenanigans not unlike today's smartphone patent-suits. Both being mentioned as separate companies instead of 'labels' suggests a date not later than about 1918. All this puts the sleeve at around the same period as the record. This is exactly what this record does sound like. When played on a wind-up gramophone, the louder passages are still very loud and full. Quite amazingly so, knowing that this is an acoustic recording - no electrical microphone or amplification was used. 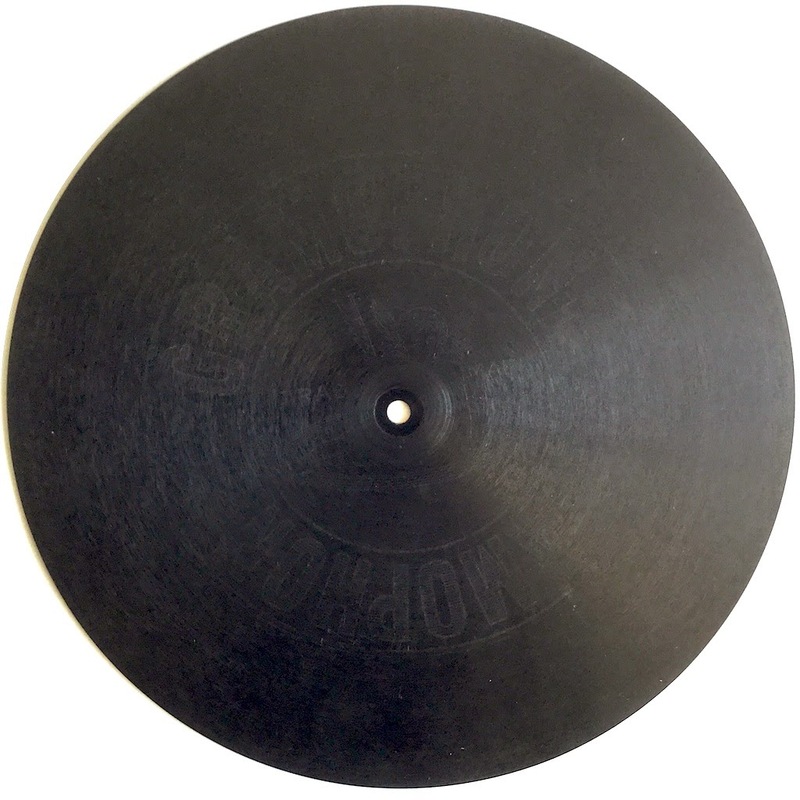 A century old disk, from the final years of the belle époque. Such a beautiful object, it's hard to believe it's not all that rare or valuable. Many were broken of course, but vast amounts were pressed! Great information! It's very thrilling being able to find so much information about an old recording. In my opinion that makes it a lot more enjoyable listening to them, being able to put them in their right historic context. In Mexico they started selling records very early in the 20th century, but the Revolution and its aftermath halted a bit the introduction of new business ventures. It is usually accepted that the industry per se was born in 1927 when the first records were pressed locally. My oldest records are from this period - 1926 or so - and are always two-sided discs. I haven't even seen a single-sided "Victrola" record for sale here, so maybe in Mexico these older records can be considered rarer and more valuable. You're absolutely right. It adds something to every record.